Cardiff secured a vital victory in their pursuit of Premier League safety by concluding a traumatic week with a 2-1 win at Southampton thanks to Kenneth Zohore's dramatic stoppage-time finish. Their struggle against relegation has been largely overshadowed by the confirmation of the death of their striker Emiliano Sala, whose body was this week recovered from the crashed plane that had been taking him to Cardiff, and they paid him the ultimate tribute by securing three important points. Victory crucially takes Cardiff out of the bottom three and above Southampton, who had been undefeated in the top flight since the turn of the year under their new manager Ralph Hasenhuttl. 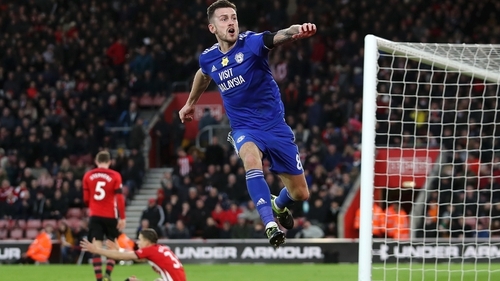 It also ensured successive top-flight victories for the Bluebirds for the first time since April 1962, and came after the hosts had already pulled level in stoppage time. Andre Gray piled the pressure on Everton manager Marco Silva after he scored the winner for Watford in Saturday's grudge match at Vicarage Road. Silva was back at Vicarage Road for the first time since he was sacked as Hornets manager amid suggestions he had attempted to engineer a move to Everton, and, in the build-up, the typically outspoken Troy Deeney did his best to stoke the fire. Speaking at a fans' forum, Deeney urged the Watford supporters not to be too harsh on his former manager. Instead, he said: "Leave him alone, let us kick the s*** out of them." Watford's captain added: "The people at Everton are fantastic. Not the manager." He may have been more diplomatic in his programme notes, describing the hype surrounding his former manager's return as a "pantomime", but it was Deeney and his Watford team-mates who would enjoy the last laugh. The striker, back from suspension and able to face the Hammers after appealing against an additional ban, struck 14 minutes from time to rescue a share of the spoils. Mark Noble had fired West Ham into a first-half lead from the penalty spot, but Palace were worth their point and would have equalised earlier but for an incredible miss by James McArthur. Instead it was Zaha, sent off at Southampton last week for sarcastically clapping the referee, who milked the applause with his late leveller. In-form Burnley boosted their Premier League survival hopes after Chris Wood's double set them on course for a 3-1 win at Brighton & Hove Albion. Sean Dyche's Clarets had slipped into the relegation zone ahead of kick-off following Cardiff's dramatic 2-1 victory over Southampton, but they responded in style as composed finishes from Wood either side of half-time put them in control at a rain-soaked Amex Stadium. The visitors, who were also indebted to an inspired first-half display from goalkeeper Tom Heaton, went further ahead through Ashley Barnes' penalty, before Shane Duffy pulled one back for the Seagulls. Success on the south coast stretched Burnley's unbeaten run to seven top-flight games, leaving them level on 27 points with their out-of-form hosts. Chris Hughton's Albion have been sucked back into relegation danger after taking just two points from a possible 18 during a six-game winless streak since the turn of the year.